That mostly means birthday in French. 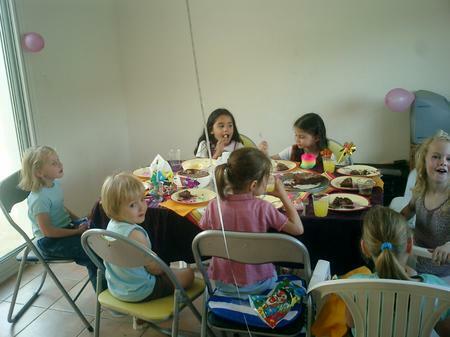 So, we had Nadia's five year birthday party yesterday. Went very well. We were a bit nervous about that. You know, we're still a bit unsure about some French customs, and whether things work the same or differently than in the States. How do we invite people? Do the parents drop off their kids, or do they stay? Do we arrange games? Do we give them a "loot bag" with little trinkets? Luckily, things work pretty much the same. Except for that it maybe is a bit harder to manage a gang of little French girls. French kids seem surprisingly assertive. They generally know what they want and what they don't want. And don't hold themselves back asking inquisitive questions. I've more than once been cornered by some little kid in the playground who had a long list of things that needed explanation. Where I come from, and why, and why my daughter spoke English, and what I think about this or that. Anyway, by now my daughter blends in much better than I do. She has her clique of pals from school, and blabbers away in French with little problem. going around that there is more to this party then meets the eye. 14 Jun 2004 @ 14:02 by Danny @63.164.145.198 : PICS!!! 14 Jun 2004 @ 15:22 by petavie : joyeux anniversaire ! To the little one, probably no big deal to the little one, adapting is their second name, sort of, I mean they are fluent in everything at a young age, tis only when we, as "grown up" start putting doubts and "education" in their minds that they atart having troubles ! Sad.... isn't it ?! 17 Jun 2004 @ 15:57 by Martin Dugage @81.51.97.36 : Bon Anniversaire Nadia! J'espère que tu as mangé un bon cassoulet toulousain pour ton anniversaire. Elle a bien sûr mangé beaucoup de gâteau chocolat.